The SUV picks you up at the door of your lodge just before dawn and sleepily you climb aboard. The guide, who is likely to be grinning from ear to ear, greets you cheerfully and talking a mile-a-minute, heads out the gate. For a while, you drive along a tarred road, then turn onto a dirt track and after some minutes, through the gates of the game park. You have entered that magical world where nature still rules and where you dare not step out of the vehicle for fear of your life! Here you rely upon the guide to locate the concealed animals and explain to you what you are seeing and to return you safely to your lodge at the end of the morning. Who is this guide? Where does he fit into your African experience? After you arrive at the camp when at the lodge or in the nearby town buying curios, look closely at the people. Here is where your guide, your driver and the other people who help make your holiday a pleasure, live. 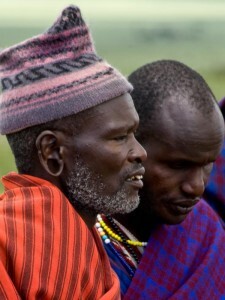 They are the locals – speaking the language common to the area (e.g., Chinyanja near Luangwa park in Zambia, Xichangana at Kruger in South Africa, Maasai on the Serengeti). Not many will be highly educated; those who have gone on to high school and college are likely to have moved to town to work. Here in the villages and towns nearby the camp are ordinary farmers, who have had to come to terms with living near a park where most people (including their governments) care more about the animals than them. This is because tourism is big business in Africa, and you are both parts of the problem and the solution. The historical relationship between man and animals in Africa is predatory: traditionally people hunted and ate many of the animals that tourists now come to see. Similarly, animals have tended to prey upon the humans (and the crops) near their habitat. Such behavior is terrible business for game parks and lodges, so a new relationship between man and animal has had to be forged to make wildlife tourism viable. 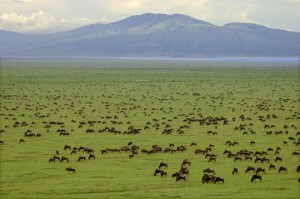 This takes the form of ‘community-based wildlife management,’ where people living near game parks come to benefit from the robustly enforced rules that protect animals as well as the fences that cut villagers off from the forests where they have always foraged for firewood, mushrooms, medicines, roots as well as animals. To ensure that villagers near game parks don’t ‘poach’ animals (to eat or sell) and positively benefit from the wildlife business on their doorsteps, it was necessary to give them a direct interest in the success of wildlife tourism. Generally, this means employing them, which often requires their training – to work in a shop, or as a maid or driver. They may need to be taught a new language, generally English. The more educated may be trained in wildlife management and find a job with the national wildlife service. Some will become spotters for hunters (in specially designated areas) and guides for tourists. These are the lucky ones, who directly benefit from the park and its visitors and surely want to see both prosper. Others receive benefits less directly: those living nearby may receive meat from hunting parties, or find work in secondary businesses (making and selling curios and crafts, growing food for the lodges, washing clothes for visitors, etc.). So, when on safari don’t look solely at the animals, but take note of the people who serve you, who offer you their knowledge of wildlife. They are the real owners of Africa’s game parks, and it is they you should thank for sharing their unique and glorious habitat.